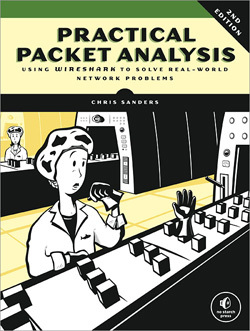 I recently had the privilege to review a copy of Practical Packet Analysis (Second Edition) by Chris Sanders. This book, which is published by No Starch Press, takes a straight-forward approach to analyzing network traffic with Wireshark, a free and open-source packet analyzer. This book contains an in-depth approach to packet sniffing, a necessary skill needed by all administrators and engineers, that makes it easy for people from all knowledge levels from the beginner to the network engineer to learn something from the concepts that are taught. The topics in the book range from the basics of network fundamentals and how to sniff a network to analysis of more complex topics such as man-in-the-middle attacks and wireless analysis. Additionally, Chris' easy to follow, down to Earth writing style, combined with the ability to plainly explain the concepts that he was presenting in the book, make this an incredible learning tool. In addition to all of the information that is presented in the book, one of the best value-adds is that all of the capture files that are used in the examples are available from the No Starch Press website, so that one can load them into Wireshark and follow along. This really helped as it provided for a real, hands-on approach to understanding the presented concepts. After reading this book and following along with the files and real-world examples, I felt as though I had attended a week-long class on packet analysis. Practical Packet Analysis is a must have for both the person just starting out in network troubleshooting as well as the seasoned professional who would like to refine their skillset.